Sri Lanka is a vibrant, bustling country with an amazingly diverse history and a wide range of influences that have made it into the fascinating place it is today. There are delicious eating opportunities around every exciting corner, from the colourful street markets to the five-star hotels and restaurants. I even discovered several new dishes which became firm favourites. 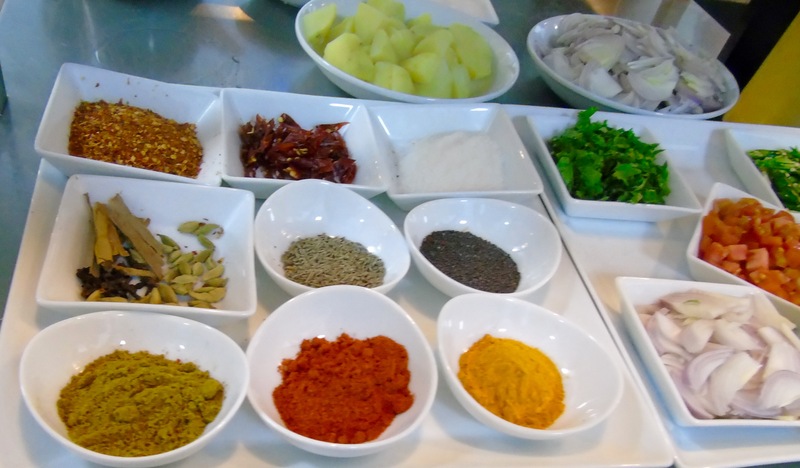 I’ll be testing out some Sri Lankan recipes myself at a later date and sharing them with you, so watch this space. You can read more about my trip to Sri Lanka by clicking here. 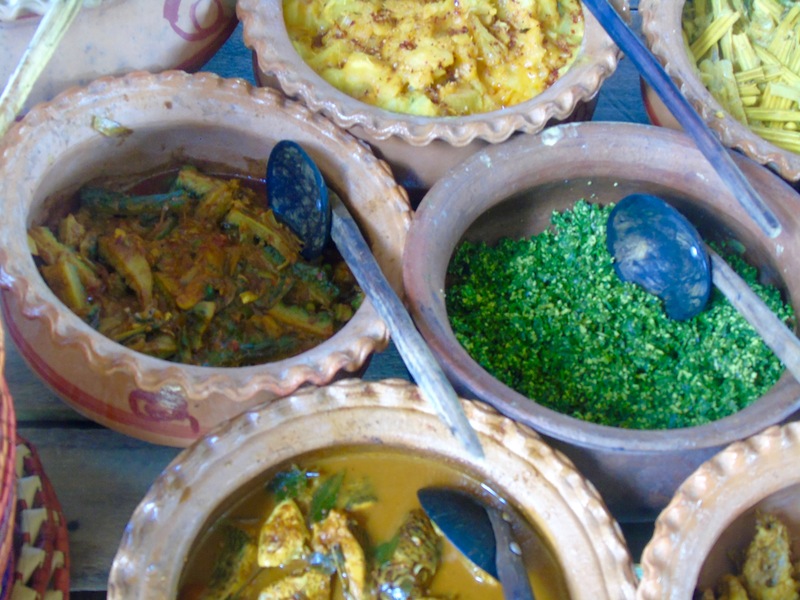 Now sit back and devour my pictorial tribute to Sri Lanka’s wonderful food. There’s plenty of fruit on offer and the streets are lined with a seemingly endless supply of wonderful produce. 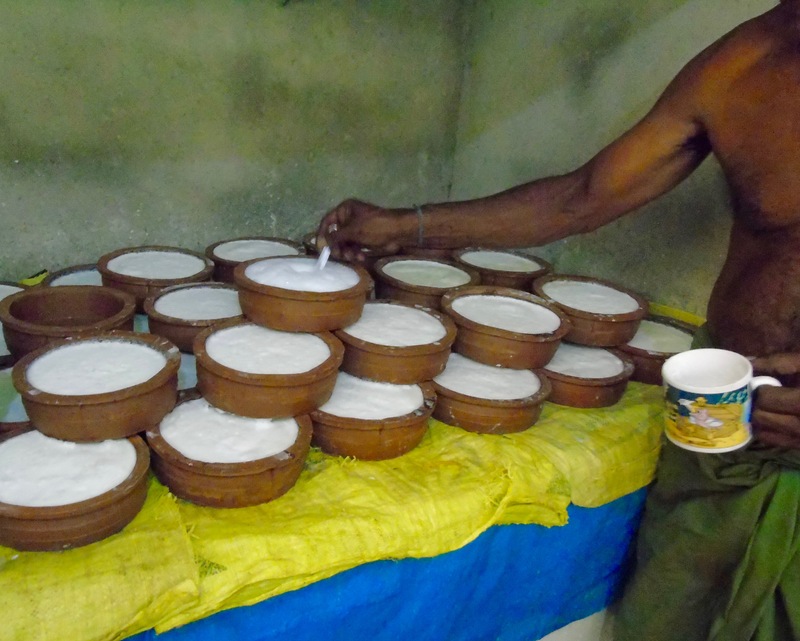 Buffalo curd is a Sri Lankan delicacy. We visited a farmer who makes it by hand using milk from his buffalo herd and watched him stirring his concoction over a fire before pouring it into these terracotta bowls and letting it set. It’s tart and tasty and usually served with their deliciously sweet jaggery syrup. 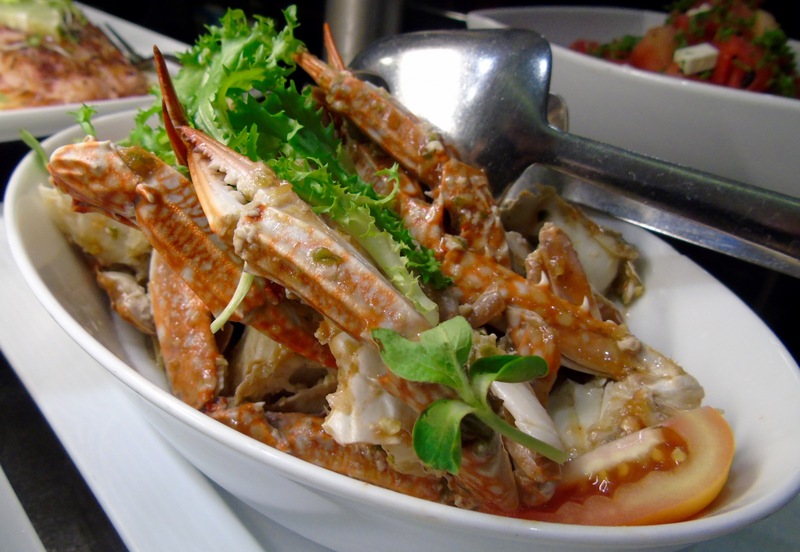 Restaurants serve up fresh crab in many shapes and forms. It looks beautiful with shells in pinky/ orange and tastes sweet and juicy. 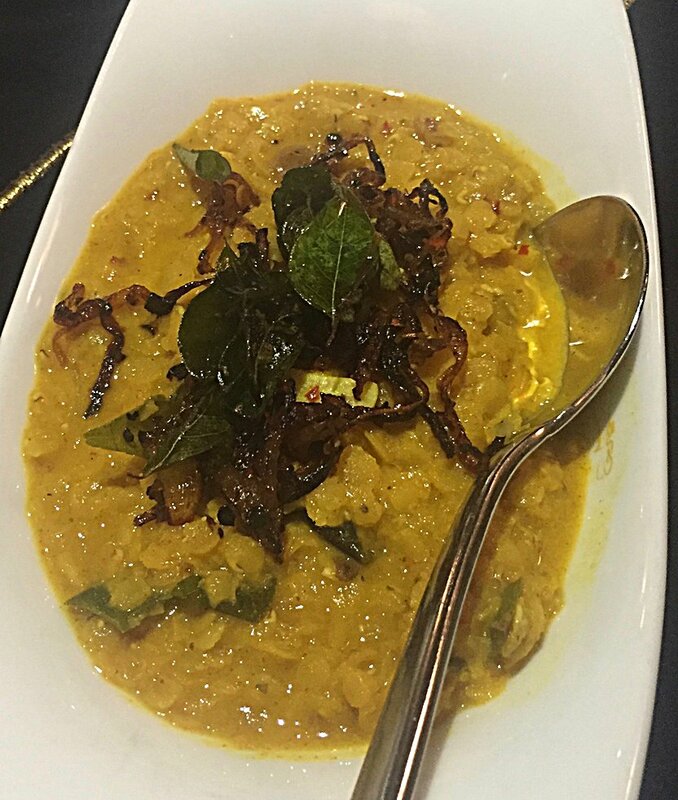 Dhal is a dish on offer with every meal – I loved it in my breakfast hopper (more of that later). Coconut cream adds a silky smoothness and richer flavour. And here’s my personal favourite. From the first breakfast when I was directed to the hopper station I fell in foodie love with these crispy Sri Lankan-style pancakes and proceeded to create different versions every time I had one. Made while you wait with fried eggs nestling in the base, they really are a great addition to any mealtime. 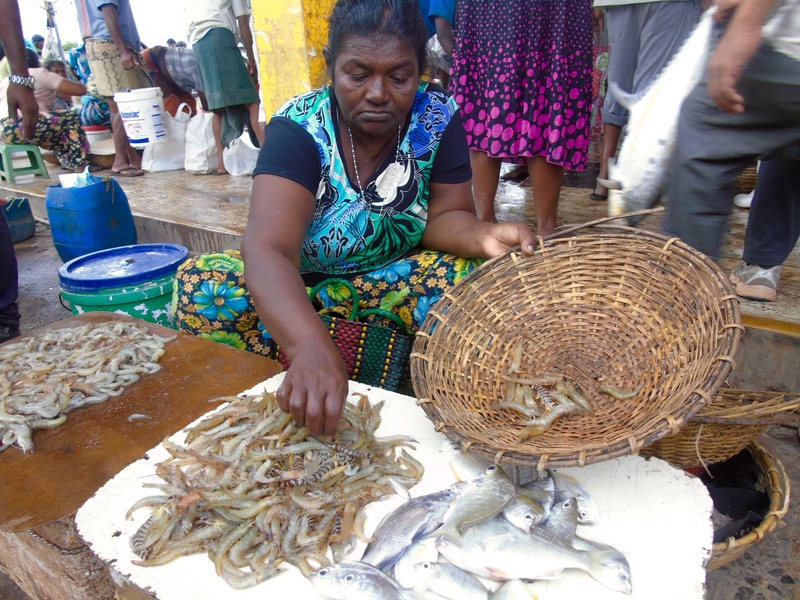 As Sri Lanka is an island you won’t be surprised to hear that there’s plenty of fresh fish to sample. One of the highlights of my trip was a visit to Negomobo fish market. 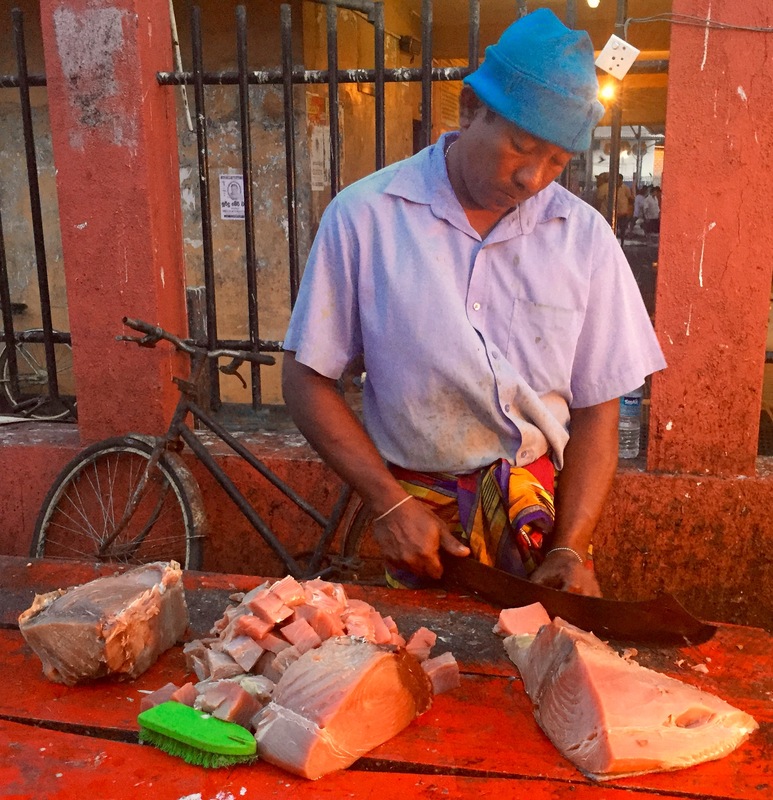 We got up before dawn to witness the boats coming in, fish being auctioned and even carefully portioned and sliced for sale to eager customers. The markets are a buzz of activity and aromas, selling a wide range of exotic wares. 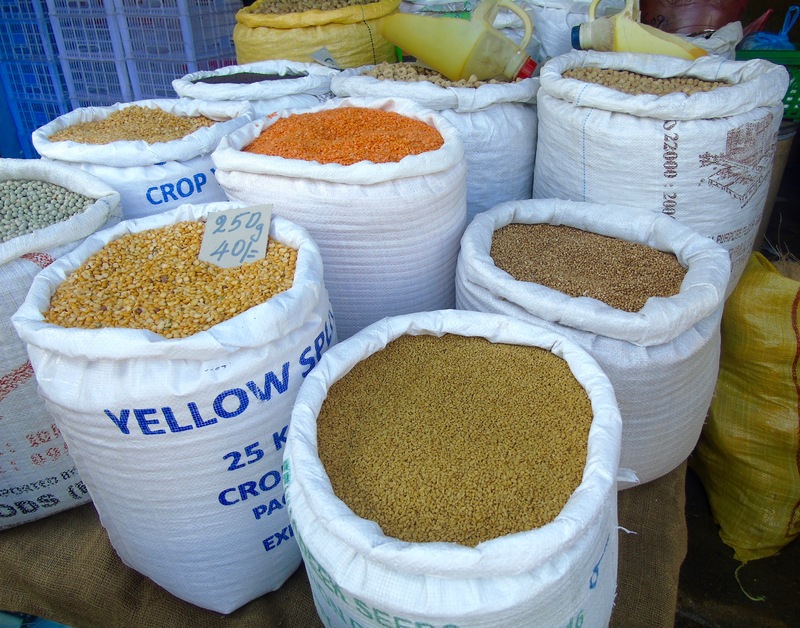 There’s a lot of grains in Sri Lankan cuisine, here they are proudly on display. Here’s my favourite hopper combo – an egg topped with dhal, tomato relish,and coconut and onion sambals. So yummy! When you have such a cornucopia of fruit on offer, you’ve simply got to make juice. 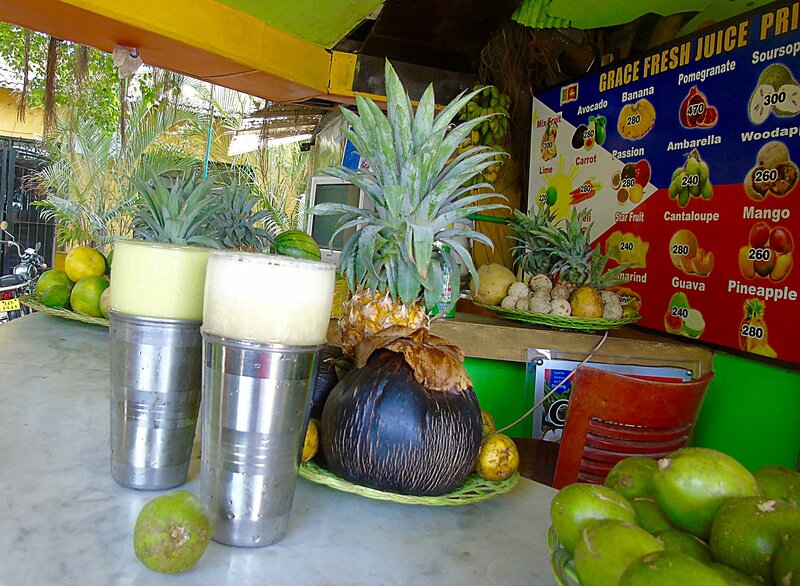 This colourful little juice bar on the street in Negombo offered a truly exotic choice. 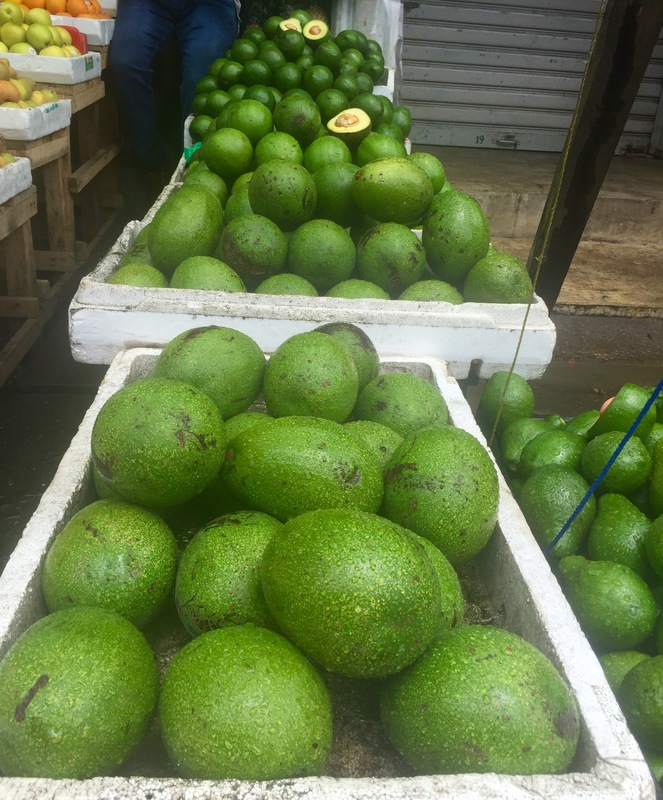 We sampled the nelli and avocado juices. Nelli is kind of like a gooseberry and the juice has a serious zing to it and leaves a bit of a tingle on your tongue. Something of an acquired taste I would say. I adore avocado so loved the juice, which was literally just avos pureed. As you can imagine, it was thick, creamy and beautifully rich – and extremely filling. 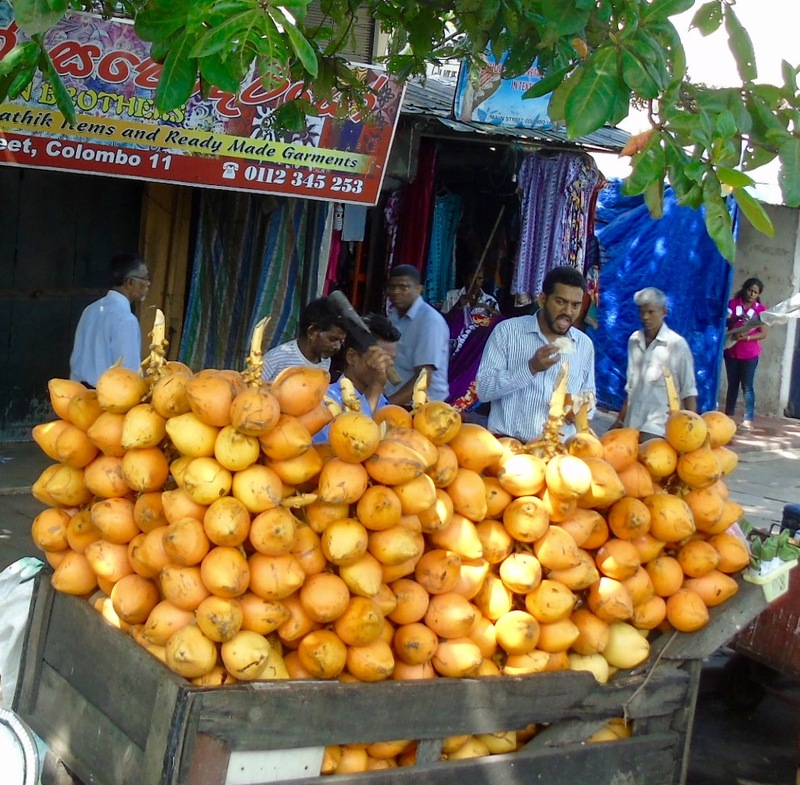 If you’re feeling thirsty on your journey there are stalls everywhere selling King coconuts. The top is lopped off for an instant, portable drink that’s full of electrolytes – ideal for rejuvenation on a sultry Sri Lankan day. One unique Sri Lankan experience I was lucky enough to experience was lunch in the chena overlooking fields of okra, chilli and tomatoes. These shelters are dotted around the lands and used by farmers to watch their crops from and prevent wild animals from destroying them. 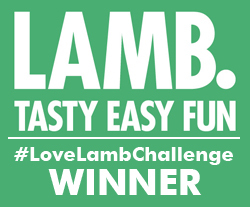 The range of 10 colourfully tasty dishes were prepared for us by the farmer’s wife using local ingredients and served with an incredibly warm welcome. Little roadside cafes are a great place to stop for lunch. There’s no menu, you’re simply brought what’s on offer that day. 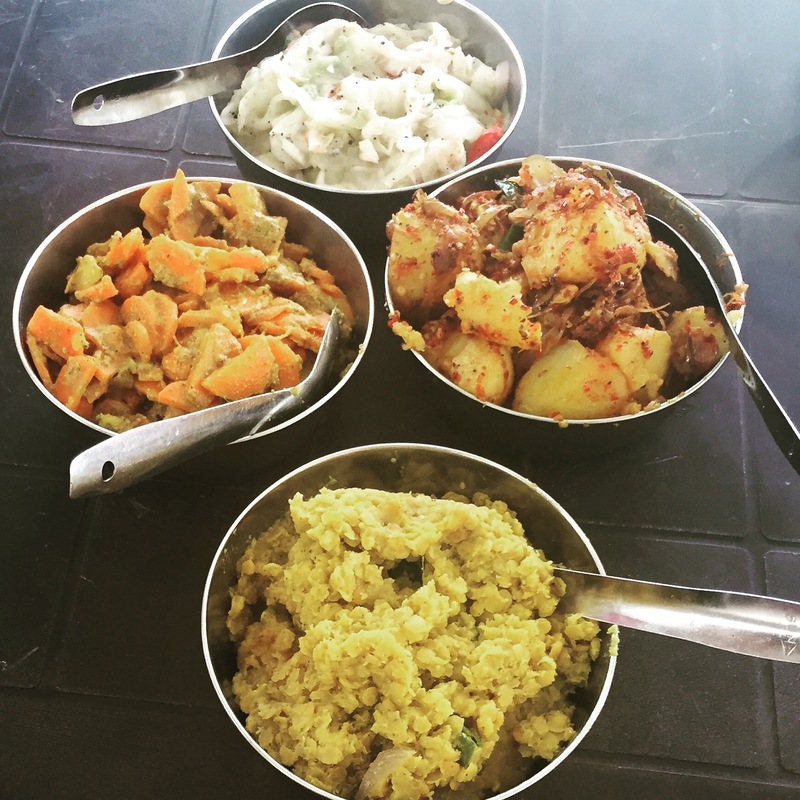 We tucked into a selection of vegetable dishes including the best tempered potatoes, a sweet carrot dish, dhal and onion relish served with smaller portions of fish and chicken and, of course, rice. I had the privilege of enjoying several cooking presentations which is why I’ve learnt lots of new recipes to share with you. As I said, watch this space. Here are some of the exotic spices I’ll be cooking with. 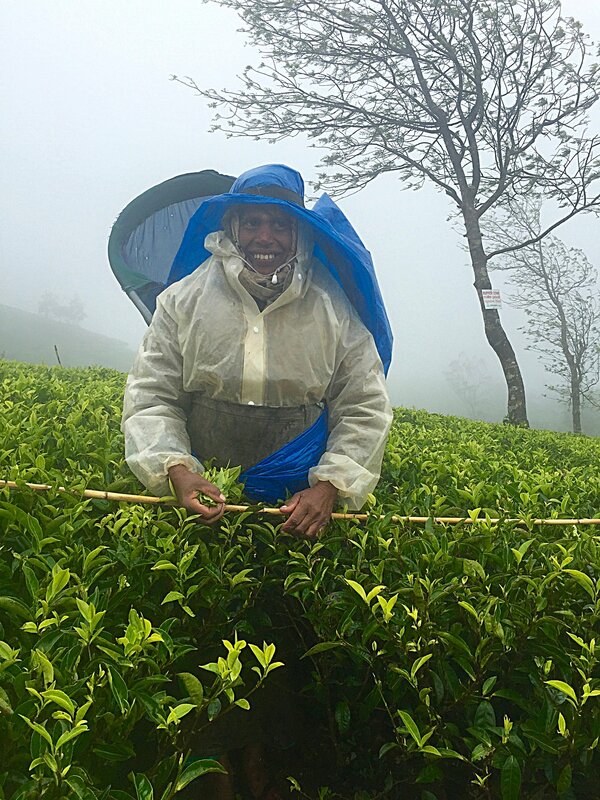 Of course Sri Lanka is also the land of tea – one of my favourite drinks. So I made sure I sampled plenty of it. I also visited the beautiful highlands around Nurawa Eliya with its emerald tea terraces as far as the eye could see and the delicate aroma of tea flavouring the air. Total tea heaven. 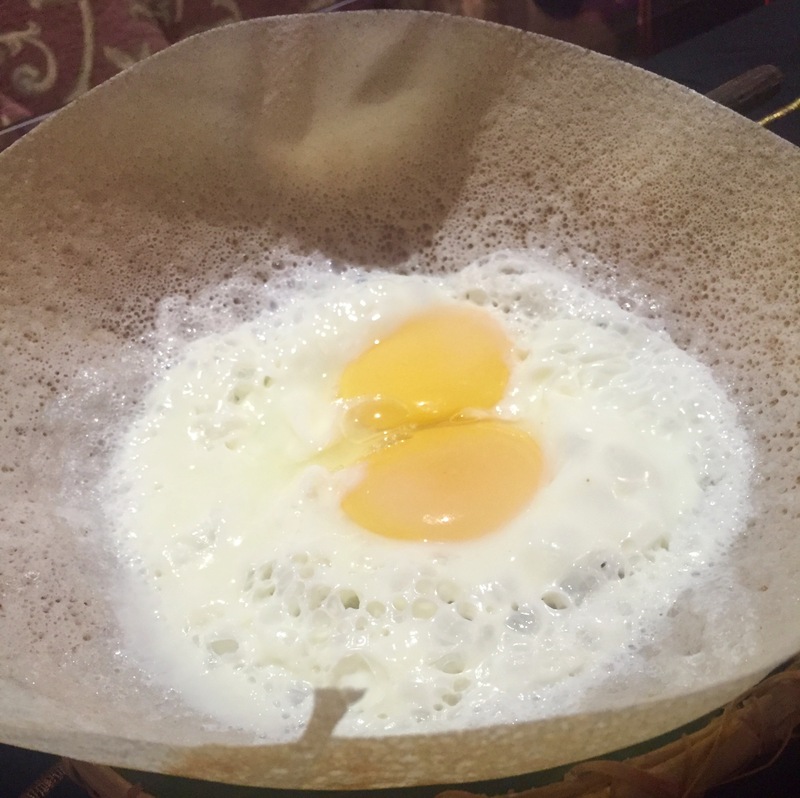 I loved the flavours and aromas of Sri Lanka. And the freshness of all the ingredients. A wonderful foodie paradise. I was a guest of the Sri Lankan Tourism Promotions Bureau on this trip. Thanks GG. It was great. I made the black pork curry and it came out beautifully.